An evaporative cooler, or swamp cooler, is an energy-efficient way to cool your home or business in a natural, water-fueled way. They perform best in hot, dry climates and work by filtering hot air through wetted filters that cleanse and cools hot air. They do need to be positioned near windows or open doors to work best. The 25 lb., Honeywell CO25AE Portable Evaporative Cooler is our top pick- It measures 18.1" x 18.5" x 31.1", disperses air up to 9.3 yards, can cool rooms up to 250 ft.², and features 4 different speed settings, all handled with a remote control. 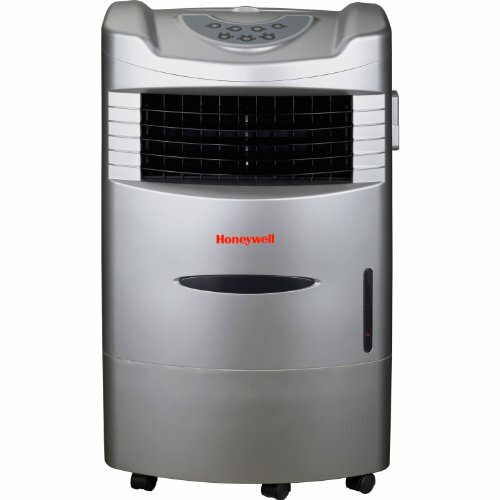 Users are pretty satisfied with this Honeywell evaporative cooler- with one user saying that he's given up on air conditioners because his cooler makes his room frigid at s fraction of the cost. Another user commends the high-quality design, the sturdy construction, the extra large capacity, and it's easy-fill ability. Most were generally genuinely surprised at how cool it made their bedrooms and living rooms- cooler than their air conditioners had, in some cases, all at a fraction of the energy cost. All of that said, let's take a look at some of the best-selling, portable evaporative air coolers on the market today and see how they compare. This 26 lb., remote-controlled Honeywell Portable Evaporative Air Cooler is a solid portable air cooler with two cooling modes- including an evaporative cooling mode and fan only mode. Users love how it is very energy efficient, especially compared to an air conditioner. It should, however, be used in the right climate area. The CO25AE cools an area of about three hundred square feet. It also holds about 6.6 gallons of water loaded from the top and has an alarm for when the water is getting low. The Honeywell is an energy saver and is UV as well as water-resistant. A few users, one being from the L.A area, said that the humidity there was just too high for the Honeywell CO25AE to put out cold air. They went on to say that when the humidity dropped to about seventeen percent that it worked just as it should. One buyer mentions that the Honeywell works great and it is easy to remove and clean the cooling pad, but finding a replacement wasn’t quite as easy. This evaporative air cooler is a good option if you are in a low-humidity area and are looking to stay cool on hot days. 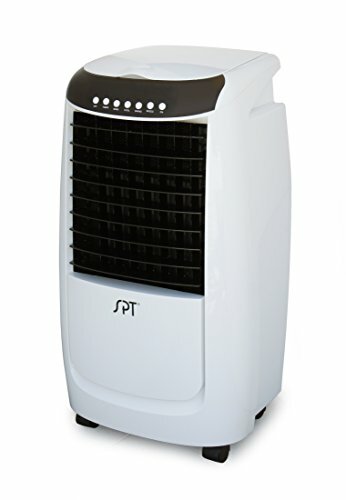 This 13.2 pound, SPT Evaporative Air Cooler is another solid evaporative air cooler that comes with three air and three fan speeds. Users like how well it works in a humid area and that it helps on their energy bill, but some customers were not happy with the power of the fan. The SPT SF-614P has a water capacity of seven liters, it is best used in dry climates and open areas. The Evaporative Air cooler has wheels on the bottom so it is easy to transport from one part of the house to the other. One user said they had a small apartment and it worked great to cool the rooms, especially when it was also accompanied by another fan. Feedback is scattershot- from those that love it and saying that it works great for them to those that said it was useless and less effective than a fan. A few of the purchasers also had a problem with water leaking from the bottom. One reviewer talks about how it really helped save on their energy bill from previously using a air conditioner. This evaporative air cooler is an inexpensive option if you are looking to cool a small area or room. 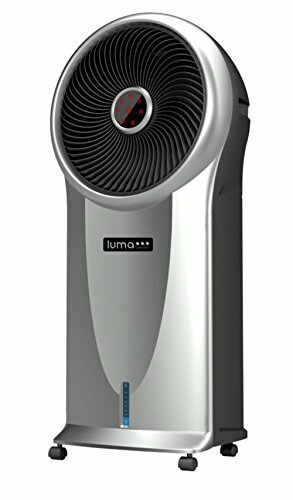 This 16.2 pound, Luma Comfort Portable Evaporative Cooler is an ‘okay’ portable evaporative cooler with a large, removable water tank. 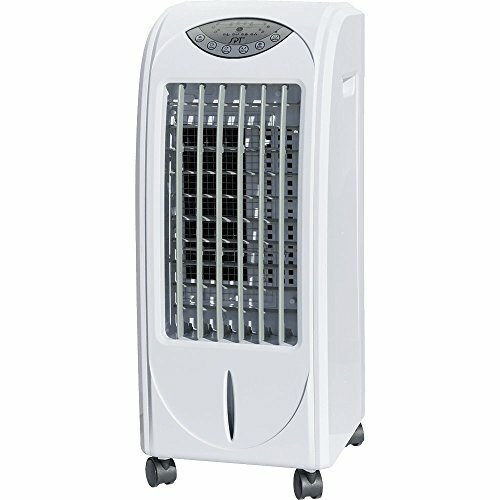 Users liked that it had three cooling speeds and wind modes, but have had a problem with the longevity of the product. The Luma CFM has a digital control panel and covers up to two hundred and fifty square feet, it also has wheels on the bottom for easy portability. The energy saving perk of the Portable Evaporative Cooler, manufacturers claim, is that it only uses as much energy as a single light bulb. From an aesthetic point of view, it is very sleek with a silver and ash black look to it. One user that used it in Colorado said that it worked great for them but it broke after two years of use. They were overall very happy with the Luma but disappointed at the longevity. Another user said that they also liked the EC110S but it stopped working on them after a year. More than a few purchasers were both surprised and happy with how quiet the Luma was. 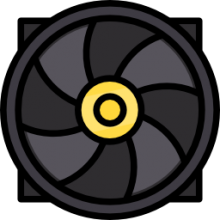 A lot of the users said that it was only good for the fan and that the cooling did not work for them. This sleek & portable evaporative cooler is an ok option for those looking to cool a small area of their house- but be forewarned that there have been durability issues with this model. 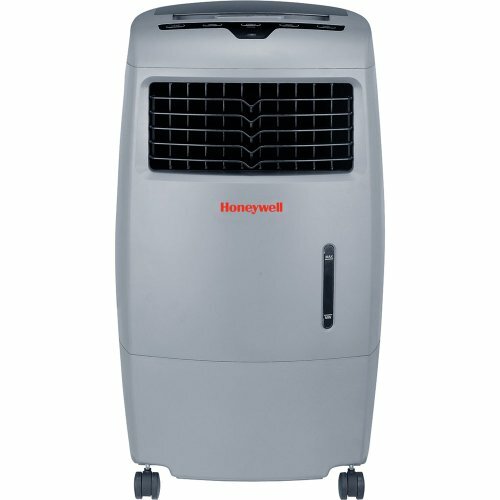 This 25 lb., Honeywell CL201AE Portable Evaporative Air Cooler is a mediocre portable indoor evaporative air cooler that is best for hot dry climates, where there is low humidity. Users liked how easy it was to set up right out of the box and get running, but recommend that you should try to keep some space in the back of the unit. The Honeywell CL201AE comes with a top-loading ice compartment and a 5.3-gallon water tank with a fill door. It also comes with a water level indicator and a low water alarm. The Indoor Portable Evaporative Air Cooler should be placed in front of an open window or door. Customers have used this in many different locations such as attics and bedrooms, with one user claiming that it helps him go to sleep at night because the room is cooler. Multiple users comment on how quiet it is and one says that even though, for them, it didn’t cool the entire room as long as it was facing them it did the job just fine. Another buyer also said that it only was cooler when facing them, except they were more bothered by this. They went on and also said that it goes through water in a couple of hours and two trays of ice in a couple of minutes. But other users didn’t seem to have this problem- so it could possibly be the unit or location or maybe not. This portable, evaporative air cooler is a decent option for those looking to cool a small room and enjoy portable cooling. This 19 lb., SPT Evaporative Air Cooler is an evaporative air cooler with automatic, horizontal oscillation and manual vertical louvers. A few users were happy with the product and said that it was good for the little room, but the majority of buyers either didn’t like it or had a problem with it. The SPT SF-6N25 has three different speed levels and a shut off timer of seven and a half hours. It only uses sixty five watts of power which helps save on electricity. Multiple buyers had a problem with leaking while others said that it had an off-putting smell to it. One buyer who liked the Air Cooler said that for the first two days and they had to spray perfumes and such. But they went on to say that after the two days the smell went away and they enjoyed the SPT. Another customer said that if they didn’t add ice in with it that not much would change as far as cooling but with the ice it made all the difference. This probably isn’t the best buy considering the negative feedback we’ve seen it accrue over time. Evaporative cooling is a cooling process that harnesses water evaporation to decrease temperature. If you didn't already know, when you perspire, this is the natural way that the human body cools down when it feels overheated. Evaporative cooling systems are a ideal way to reduce the temperature in warmer climactic environments- specifically in hot, dry areas, but not so much in humid ones. The evaporative coolers themselves work by a series of fans that intake hot air through a bunch of wet pads. The hot air will move through these pads and become cooler, with this cooler air being pumped through the evaporative cooling tower's vents or pushed through a duct system. One side effect of evaporative cooling fans is that they will increase the humidity of a room just a little bit- this is because of increased water in the air. This isn't necessarily a bad thing, because living in a dry climate can have negative health effects on your skin. Many users commend these evaporative cooling tower systems because they make their feel more fresh. As opposed to air conditioning systems that require all of the windows in your home to be shuttered, an evaporative cooling fan needs the windows to be open in order that they residence's warm air can leave and the evaporative cooler can vent in the cool air. If you have ever left the air conditioner on for an extended period of time, you are familiar with its stale and fatigued effect on the environment. An evaporator cooler doesn't produce that sickly effect because it is constantly churning out fresh breezes that many people find natural and invigorating. As well, an evaporator cooling system is not as expensive as a traditional air-conditioning unit- this is because it doesn't use as much energy to operate. These systems go by different names, with many users referring to them as wet air coolers, desert coolers or even swamp coolers. For outdoor cooling, you might want to consider a misting fan- it's an interesting, alternative option to cool-down during the summer months. Another advantage to the evaporative their coolers that we have reviewed is their portability- most of them have wheels that enable them to be positioned throughout your home or business so that you can strategically cool any area, as you require. One user who works in a research and development lab describes how it heats up to almost the 120° in the summer- he keeps his evaporative air conditioning unit running all day long and it's able to cool the area down to below 80°. Indeed, some people when confronted with the option of installing an expensive central air-conditioning system end up opting for purchasing several swamp coolers- and in the long run they are ultimately pleased with the return on their investments in the form of heavily reduced energy costs. Though users saying that it is incredibly inexpensive, with one active user claiming that it only cost him $10 to run it for an entire month, most buyers cautioned that you will need to live in a dry climate for these evaporative coolers to work. The reason being is that the coolers function based on a scientific principle- that is that heat will be transferred from the air and turn into water droplets in the form of latent heat. In other words, the heat will still be present, but you and your family will just not feel it. It is actually vented out the window in the form of evaporated water. That is why it's important to keep the windows open- it allows the heat to leave your room while also ensuring the humidity doesn't build up. While you can certainly purchase one of these evaporative coolers from a big box retailer like Lowes, Target, Home Depot or Walmart, many people opt to purchase it online- oftentimes you can get the best prices there as well as free shipping, and since it's delivered to your door you don't have to worry about having to get it into your car and lugging it up your front door steps.